This article will clarify the differences between an essay scoring at Band 7 and an essay scoring at Band 9. The explanation of these differences will help you to reach a higher score for Task 2 of the Academic Writing category of the IELTS exam. Firstly, it’s vital to understand the expectations of the examiner who will score your essay. 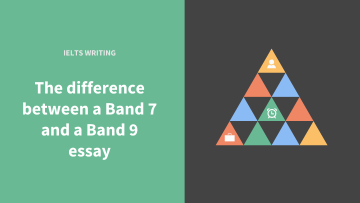 There are clear differences in criteria that determine a Band 9 from a Band 7 essay. A Band 9 essay answers the essay question in full and offers a well-developed response. The essay is perfectly cohesive and paragraphed, uses a range of language, expression and accurate structure. A Band 7 essay aims to respond to the question although the answer could be more fully developed. It attempts a cohesive structure and logical flow but there may be some omissions of connectors. A Band 7 essay shows a sufficient scope of language with occasional redundancy, errors in word selection or minor grammatical mistakes. Should wealthy people be obliged to share their financial success with poor people by supporting health services and education, or is this the responsibility of the poor to improve their own standard of living? I believe that wealthy people should be obliged to share their wealth with poorer people. But they should not have to support health services and education only, but other areas if they prefer. First of all, we cannot avoid people which are poor. As an example, we see homeless in the train station, at the bus stops and asking us for money. Rich people have extra money and therefore, they should give some help to people with no housing and money. Secondly, many people now are not finding jobs or although they are working, they are not having enough money to pay for his houses or flats especially in city-living which has a high cost of living now. For example, people living in London are working at low income salaries but the cost of living is so higher in contrast. Therefore, it is difficult for these people to have extra money for extra things. In the introduction, the writer addresses the first part of the question but doesn’t respond to the second part regarding the poor taking responsibility for its own standard of living. There is a punctuation error and some redundancy using the word but. In the second paragraph, the candidate provides a topic sentence and example. The example is quite vague – there is no reference to a specific train station or how rich people could give money to the poor. Instead of using a synonym, the writer uses the word money three times. The second paragraph is slightly better as the example provided is specific. It refers to London and illustrates the contrast between the cost of living and purchasing power. However, the errors in tense, wrong possessive adjective (his instead of their) and basic, repetitive language will keep the scoring of this essay to a 7. Income and equality is an issue that has plagued civilisation since the beginning of time. Whereas, some societies strongly disagree with “every man for himself” others believe in helping their neighbour. The following essay will cover European approaches using real world examples to support arguments. Whereas, – more advanced grammar structure. “every man for himself” – correct use of idiomatic expression. helping their neighbour – not exactly an idiomatic expression, but a stylistic way of referring to helping out others. The following essay … – Signals to the examiner the direction we will take the essay. Wealth distribution for social ends such as healthcare and education is seen as a basic societal right in Denmark. There are also tremendous benefits for levelling the playing field. For example, a recent study by the University of Copenhagen showed that when the rich were forced into sharing their income amongst the economically challenged, over 70% of the wealthy reported feeling a higher sense of wellbeing afterwards. Therefore, although it is undoubtedly contentious, there are tremendous benefits for rich and poor alike to participate in wealth sharing endeavours. social ends – eloquent manner of expression and also less common than other expressions. economically challenged – variation of language – not consistently using “the poor”. “levelling the playing field” – appropriate use of a specific idiomatic expression. rich and poor alike – more sophisticated way to express “both”. Secondly, evidence from history shows that laying the responsibility with the poor to improve their lot is clearly an erroneous policy. In most humanitarian governmental bodies, scientific reports have proved countless times that the initiative must start with external assistance. For instance, a pilot study showed that when poverty stricken individuals where motivated by more than just themselves i.e external mentors, they had a success rate three times higher than self motivated candidates. Thus, experts generally agree that the most effective humanitarian assistance involves helping one to help themselves, which underscores the common expression “no man is an island”. laying the responsibility with – sophisticated grammatical structure. “improve their lot” – very appropriate idiomatic expression because it’s strongly related to wealth. erroneous policy – more sophisticated than saying “wrong policy”. humanitarian governmental bodies – topic specific vocabulary. …. success rate three times higher than self motivated candidates – comparison grammar structure. “no man is an island” – yet another idiomatic expression from a famous English poem. -albeit under duress– a very sophisticated way of saying forced. Each paragraph starts with a topic sentence that clearly defines the writer’s opinion and main ideas. Complex adverb clauses – starting with Whereas and While – are well-structured. Instead of repeating the word obliged, the writer uses synonyms such as required and have a duty to offer a variety of language. The examples in the first and second paragraphs are very specific and clearly develop the main idea. To conclude, manage your time so you can plan a clear outline, your main ideas and use a variety of language and accurate structures to put together a succinct argument that fully answers the question. If you want to improve your vocabulary, and start learning more topic specific vocabulary, using Ted Talks and gap fill exercises, then download this massive jumbo PDF of IELTS materials.